Uranium Ore Stored At Grand Canyon Park Museum May Or May Not Pose Health Risk A safety director issued a public warning that buckets of ore may have exposed employees and tourists to unsafe radiation. But it's not clear whether anyone experienced dangerous levels of radiation. 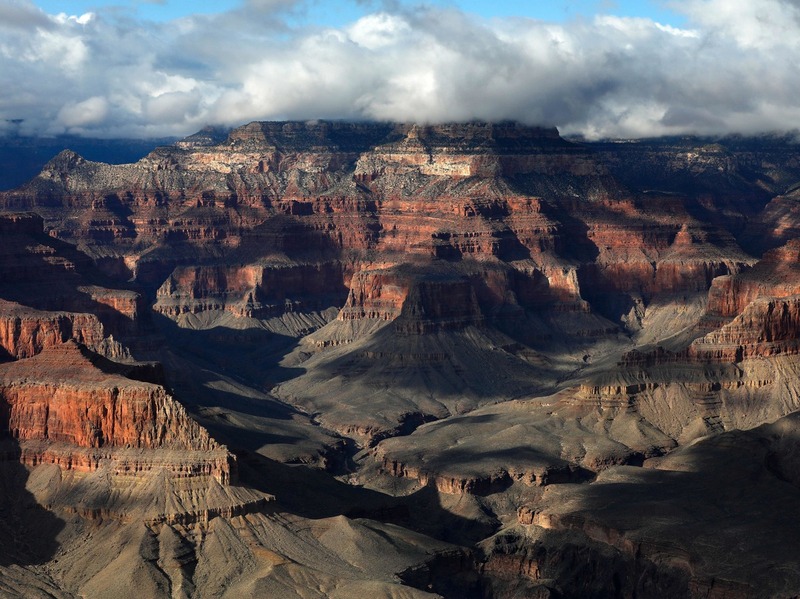 The safety director at Grand Canyon National Park says people may have been exposed to radiation from three buckets of uranium ore that sat for years in a museum collection building. Whether the amount of exposure was unsafe has not been determined. For many years, three buckets full of uranium ore sat in a museum building at the South Rim of Grand Canyon National Park. Tours often visited the museum collection building, with children on tours sitting next to the buckets for a half-hour. Recently, the park's safety, health and wellness manager, Elston "Swede" Stephenson, sent out an email to National Park Service employees and approached the Arizona Republic to warn that people in the building were "exposed" to radiation. Whether that proximity was unsafe has not been determined. Simply being near uranium ore is unlikely to result in an unsafe dose of radiation. "Uranium can be harmful to people's health depending on the amount and grade of ore, how people interact with it and the exposure time," Jani Ingram, a professor of chemistry and biochemistry at Northern Arizona University, tells the Associated Press. But, she says, "You can't say, 'Oh my gosh, all those kids are going to develop cancer in five years' because you just don't know how close they were, how long they were there," she said. "But that open bucket was probably the most concerning. It seemed that maybe whoever it was didn't understand what they had." Kai Vetter, a nuclear physicist at the University of California, Berkeley, says that the danger from uranium ore exposure strongly depends on the time and distance to the radioactive material. "The small risk for measurable health effect does not justify at all leaving the bucket in the public and then just [removing] it," he writes in an email to NPR. He says that exposure to large quantities of the radiation emitted from uranium ore can cause cancer. "The main concern would be to ingest this material, specifically for children." Stephenson sent an email to employees on Feb. 4, warning that if they had gone in the museum collections building between 2000 and June 18, 2018, "you were 'exposed' to uranium by OSHA's definition." How was the uranium discovered after all that time? In March 2018, the teenage son of a park service employee had a Geiger counter that detected radiation in the collection room, Stephenson said. The buckets had apparently been in a basement for decades before being moved to the museum. Stephenson told the Republic that he immediately contacted a park service specialist to report the uranium ore. A few days later, technicians arrived. Photos provided to the newspaper by Stephenson show technicians arriving in June 2018 to take away the buckets of uranium ore. The technicians reportedly dumped the buckets at an old uranium mine 2 miles away, then for some reason brought the buckets back to the building. Stephenson said the park didn't do anything to warn workers or tourists that they had perhaps been exposed to unsafe levels of radiation, despite a Right to Know law that he said requires disclosing the incident. "My first interest is the safety of the workers and the people," he told the Republic. He is especially concerned about kids who were potentially exposed to radiation, at levels he calculated to be 1,400 times the Nuclear Regulatory Commission's safe level for children. Dennis Wagner, the Republic reporter who broke the story, said that Stephenson approached the newspaper to get the word out to the public after his efforts to get the park service to warn the public went nowhere. Grand Canyon National Park Public Affairs Officer Emily Davis said that the park service is coordinating an investigation with the Occupational Safety and Health Administration. "A recent survey of the Grand Canyon National Park's museum collection facility found radiation levels at background levels — the amount always present in the environment — and below levels of concern for public health and safety," Davis said in a statement to NPR. "There is no current risk to the public or park employees. The museum collection facility is open and work routines have continued as normal. The NPS takes public and employee safety and the response to allegations seriously. We will share additional information about this matter as the investigation continues." OSHA confirms to NPR that it did open an investigation into the matter on Nov. 28. "Stephenson, a military veteran who is certified as an occupational safety and health technician, was in a similar controversy during his time in the Navy. According to court records, he began calling for action to prevent falls after a series of accidents in 2016. "As complaints escalated, Stephenson was fired. He turned to the Office of Special Counsel, a federal agency that protects whistleblowers, and his termination was stayed. It is unclear how that case was resolved, but within months, Stephenson had a new job with the National Park Service. "Stephenson said the uranium exposure saga developed while he was pursuing a racial-discrimination complaint with the Equal Employment Opportunity office. Stephenson is African-American."